I have continued to use my new technique of combining sketchbook drawings with digital imagery (described in my previous post) for an entirely new series, Women of the Old West. I again began by hand-drawing the images of three women—this time using historical photos as references— using pencil and paper. The sketches of these women, who were actual cowgirls in bygone times, were been coupled with stylized, manipulated photos of real places I snapped in and around Santa Fe and Cerrillos, NM. 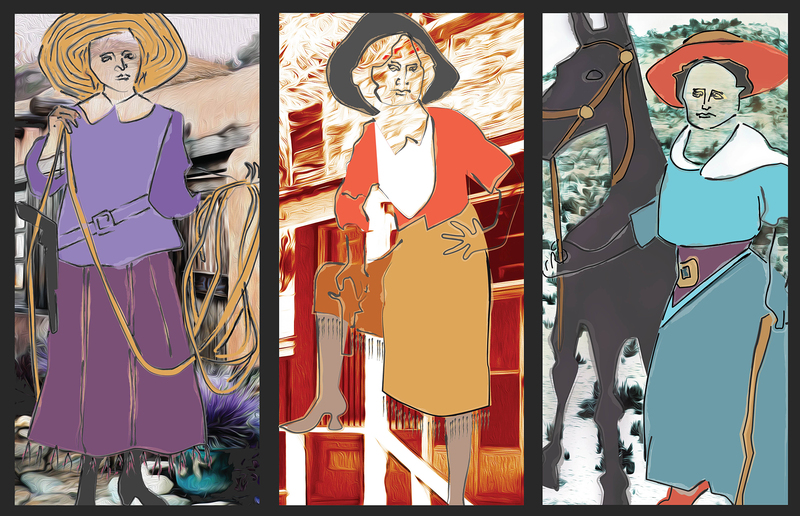 Only the women’s clothing (and horse) are opaque, allowing the backgrounds to be blended with the rest of the drawings. I plan to add two more trios of women—Native Americans and Early Settlers— to complete the entire “Women of the Old West” series. I will post each as it is completed. Watch for them!.